From tea to green, the hibiscus is on par with any other flowering plant in your garden! And, even though the deep green foliage of the hibiscus plant does add its own coloring to your home landscape, for purposes of discussion in this website we are including hibiscus in our “Flowers” section—as the brilliantly colored and showy flowers themselves are the main reason most gardeners cultivate this plant. Remember the tropical origin and nature of hibiscus if you choose to grow this plant. 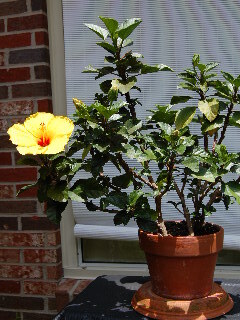 In other words, you should seek to mimic near-tropical conditions if you expect to have healthy flowering hibiscus. This means first of all that if you live in an area where the temperature consistently falls below freezing, you should grow hibiscus as a houseplant or as a container plant that you can move outdoors to the patio during the warmer months of the summer growing season. By the same token, if you are fortunate enough to live in the warmer climes with year-round temperatures above freezing, hibiscus can be grown outdoors as a stand-alone shrub or small tree or collectively bunched and shaped into hedges. Varieties of hardy hibiscus that will withstand colder outdoor growing conditions can sometimes be found at your local garden centers. These varieties often have larger blooms than the tropical hibiscus. Read the label to be sure you know about the variety you are selecting before you make your purchase. 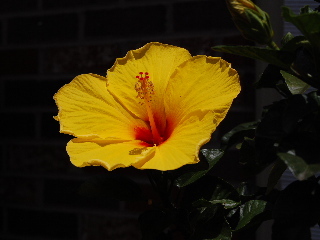 Your hibiscus will grow best when planted into a well-drained mixture of loose topsoil, organic matter, and sand. Add a balanced fertilizer during the growing season to assure steady blooms and adequate foliage production. As for light requirements, remember again the conditions that would be found under a warm tropical sun—bright but preferably of a filtered nature. Full sun in the morning hours and then shade in the afternoon is also okay. However, full direct sun all day will burn the blossoms. Light pruning to help shape the plant and give it fullness is okay, but should not be done late in the growing season. Blooms occur in a variety of colors from white to red, orange, pink, and yellow. These beautiful blooms are a visual delight to the eye of the gardener, and are also attractive to bees, butterflies, and hummingbirds--thus drawing even more living color to your garden. Hibiscus has long been used in the blending and brewing of herbal teas and is usually available wherever teas are sold. It is said to have calming qualities that can actually contribute to lowering of the blood pressure when consumed by those who suffer from hypertension. Hibiscus tea also lowers high cholesterol and is rich in Vitamin C. In addition, it is believed to relieve cold symptoms and have a soothing effect on sore throat and cough. Hibiscus—enjoy the healthful tea, enjoy the beautiful blooms, enjoy the lustrous green foliage. Good from tea to green!